We all know that Google never likes to clutter up its homepage with additional buttons or contraptions, but for its social network, Google+, the search giant has made an exception. 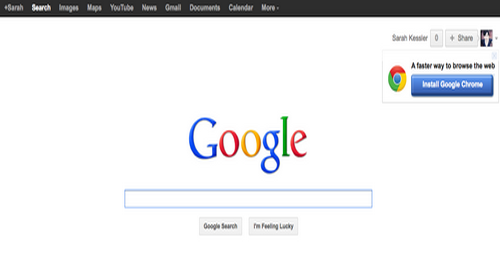 The search giant has added a share button to the right-hand corner of its patented search page design. The company said that the roll out has already begun and update will soon be available to all users. Once a user clicks on the share button, a box will open for adding updates to Google+ account. However, the box won’t include search results in the update. Marketing Land was the first to spot the share button. The share box is a part of an update to the ‘Google Bar’, announced earlier this month by Google. Primarily, the company shifts the share button from the bar to the Google homepage. The update is nothing but a minor one. The interesting thing about this update is that it is the first time that the search giant has offered any function other than search on its homepage. The Google+ integration with search results via Search plus Your World was not enough to announce Google’s commitment to its social network – one can add this update as well to show company’s deep concern. Google generates a major part of its revenue via advertisers, who anxiously want to locate the consumers who are most likely to buy their products. The search giant has ton of search and browsing data that can aid advertisers to fulfill their needs, but still it lacks the vital social graph that its competitor social network Facebook has. The search giant has been utilizing search in an attempt to create a social graph through its social network and therefore heavily advertise its network as a result. The integration is somehow reasonable. Relevant search results can be received through utilizing the social data and there is a possibility of coming across a data in search that is useful to share instantly. There are some who oppose this thought as they believe that it will take the effectiveness away of the Google Search.